The field in this year's Senior Division included many familiar teams, and also featured a couple new faces. 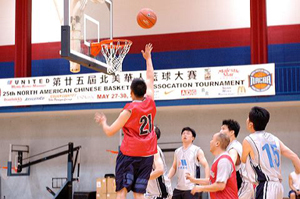 The top 2 teams in each pool advanced to the Medal Round, and the first Semi saw Chicago DNC facing the Tournament's oldest rookies, Team Texas. Texas had obliterated their opponents in Pool Play, but Chicago DNC is quite a handful. With Texas going to sweet shooting Rick Huang early and often, they grabbed the reigns early. 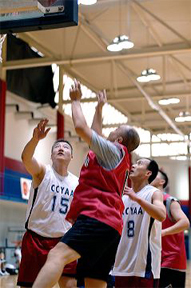 In the second half, Robert Choy used his athletic prowess and all around game to lead Chicago to a 55-46 win. The other Semi was a battle of the bigs. Ed Chu v/s Richard Zhu. Richard really was pumped for this game, and he did it all. He hit from the stripe, he stepped out to score from long distance, and then he put on a passing clinic in his spare time. 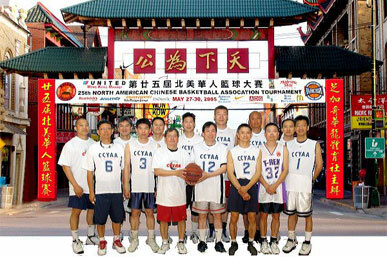 The triple threat of Richard Zhu, Jeff Fong, and Carlton Tenn scored 41 points, as Toronto CCYAA won 47-38. In the Championship, Chicago came out like gangbusters. They took it to Toronto, and ran the court like they probably haven't run it in a decade. With the home crowd rooting them on, Henry Yue and Robert Choy took charge of the game by forcing the tempo. Toronto was clearly rattled but called timeout and got back into it by going to hot shooting Carlton Tenn (16 pts, 4 triples). Robert Choy nailed a 3 at the halftime horn to tie it up at 29. In the second half, Toronto took the lead again, as the half was being played much more deliberately. Chicago had one last chance to get the win, trailing 50-49 and the time ticking slowly down towards 0:00. When they had their final chance, Chicago dribbled themselves into a corner and could not get a look at the hoop. Toronto celebrated their back to back titles. They are definitely the favorite heading into Boston 2006.